ABSTRACT—The article provides case studies for the conservation of water-logged archaeological leather and textiles. The materials described had been recovered from the underwater archaeological site of the DEFENCE (an American privateer sunk in 1779). Modifications of existing conservation treatments for these materials are described, including the use of oxalic acid to reduce metallic encrustations, the support of leather disruptions, and the use of freeze-drying in the conservation of particularly fragile textiles. THE USE OF FREEZE-DRYING in the preservation of archaeological materials is a technology still being developed. Newly modified treatments have been used with initial success at the Maine State Museum Regional Conservation Center (MSMRCC) for a variety of organic materials recovered from the underwater site of an American privateer, the DEFENCE.1 Among the materials being treated are wood, leather, and textiles. Some wood is being stabilized using a freeze-drying treatment proposed by Ambrose.2 Leather and textile treatments also use freeze-drying and some methods and materials proposed by Rosenquist3,4 and Geijer.5 The treatments for leather and textiles now in use at the MSMRCC are outlined here, and in each instance, case studies are presented. AT THE TIME of recovery from this site, the leather was often soft and flexible; or stiff and inflexible when encrusted with metallic deposits (principally iron). The surface of the leather varied in appearance from smooth and well preserved to worn and disrupted. When severely deteriorated, the leather's surface had been reduced to very fine particles which were powdery when dry. The objective of the conservation treatment presented below was to stabilize and consolidate the leather without sacrificing its natural softness and flexibility, and to restore these qualities to leather which had been encrusted with metallic salts. AMONG THE ARTIFACTS recovered during the 1977 DEFENCE field season was a shoe (ca. 24 cm. long). Even in the cold, thick mud at the wreck site, thread which had originally secured the various shoe parts deteriorated, and the artifact was retrieved in sections. The “upper” was made from leather comparable in weight (ca. 2 mm. thick) to that found in a modern shoe. Several layers of leather ranging in thickness from 2 to 4 mm. were sewn together into a sole and heel. 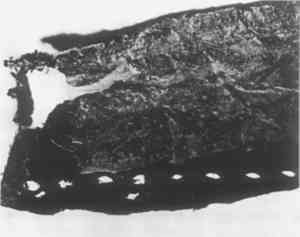 Iron staining could be seen on the surface of the leather, and when a section prepared with a freezing microtome (thickness ca. 5 microns) was viewed under magnification (100×), the intrusion of foreign matter into its structure was obvious. In this case, however, the accumulation of metal salts had not become thick enough to severely embrittle the leather. Before treatment, the shoe parts and their identification numbers (embossed on a Teflon tape or written on a strip of Tyvek6) were sewn between two pieces of fine nylon net. This encasement secured the leather fragments and their registration numbers so that they would not be confused or misplaced during treatment. The leather was kept in water at all times prior to treatment. Mold growth was curtailed by recirculating cold water (directly from the tap) through the leather holding tanks on a regularly (daily) basis. TREATMENT BEGINS by washing in de-ionized water to remove soluble salts. After removing these salts, leather which had been stained or encrusted with metallic salts was placed in a 5% (w/v) solution of oxalic acid in de-ionized water until the stain or encrustation dissipated. The leather was then thoroughly washed with tap water for several days. This procedure for removing encrustations was proposed by Tilbrooke and Pearson.7 Their treatment was designed for textiles, but in this case it was found useful when applied to leather. A freeze-drying process for leather developed by Rosenquist8 makes use of polyethylene glycol 400, but does not mention surface treatment or consolidation. At the MSMRCC, a modified freeze-drying treatment uses PEG 1500.9 The process includes the following steps in sequence: impregnation, drying and surface treatment, followed by consolidation, support, and reconstruction when necessary. Impregnation: The nylon-encased shoe parts were immersed at room temperature for six weeks (sufficient time for penetration) in a 10% (w/v) solution of PEG 1500 in de-ionized water. The volume of the solution was four to six times the volume of the leather. A. E. A. Werner, as abstracted by B. Muhlenthaler, used PEG 1500 at an elevated temperature of 40°C.10 Initially, this method was attempted, but the leather from the DEFENCE became hard and brittle. Further research showed that this method may be undesirable under any circumstances because elevated temperatures may have an adverse effect on leather.11,12 An aqueous solution of PEG 1500 at room temperature proved an effective impregnation treatment for waterlogged leather. Drying: On removal from the impregnation solution, the leather was frozen at −18°C, and transferred to the freeze-drier (Fig. 1). 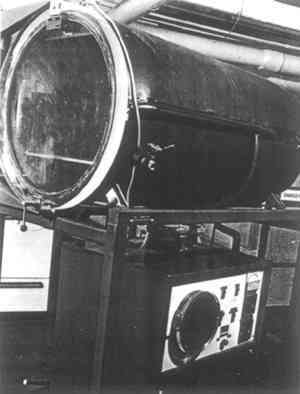 Drying required from two to four weeks; its progress was monitored by the amount of water deposited in the freeze-drier's condensing chamber. The vacuum schedule used: day 1–2000 microns; day 2–300 microns; day 3–100 microns. This schedule allowed the leather and the frozen water within an opportunity to acclimate to lowered pressures. From empirical observations, a gradual reduction in pressure minimizes the amount of surface disruptions in the leather. After three days, the pressure of the drying chamber was reduced to the limits of the unit (ca. 5 microns). The drying phase was complete when no ice was deposited on the condenser. 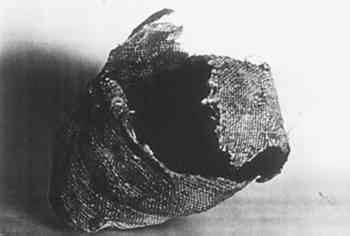 Surface treatment: Within an hour after the drying process was complete, the shoe was removed from its nylon encasement. At this point, the leather was stiff, but with an application of British Museum Leather Dressing, the desired flexibility was obtained. Within a few minutes, the dressing was absorbed into the leather (in cases of very thick leather, a second application of dressing would sometimes be necessary). The dressed leather was allowed to stand for several days without further activity before any subsequent steps were instituted. With this process complete, the shoe could be consolidated or a secondary support added prior to assembly. EVEN AFTER LEATHER has been impregnated and freeze-dried, it is important to correct problems within its structure prior to reconstruction of the artifact. Consolidation: “Red rot” can be identified as a powdering of the leather, possibly caused by sulfur dioxide.13 Suspected areas of “red rot” in a piece of freeze-dried leather were consolidated with a 20% (w/v) solution of Acryloid B-72 in ethyl alcohol applied directly to the affected area. Although no difficulties were encountered with the Leather Dressing, B-72/Ethanol interface, B-72 in Acetone or Xylene might be substituted to overcome any incompatibility. Initially this darkens leather slightly, but after the solvent evaporates, the resulting color is not significantly different from its appearance before consolidation. This application is repeated until the area does not readily accept the resin mixture. Auxiliary support: Disruptions in the leather's surface were supported with wet strength tissue and a PVA emulsion adhesive (Fig. 2). This auxiliary support was attached after the leather's surface was pre-treated with a single coat of 20% (w/v) B-72 in Ethanol. For aesthetic reasons, all tissue supports were applied to the inner shoe surface. Fig. 2. Support of disruptions in the surface of leather with wet strength tissue and an adhesive. The pre-treatment serves two purposes: first, on top of the surface dressed with the British Museum Leather Dressing the B-72 enhances adhesion, and second, the resin coating is easily reversible. 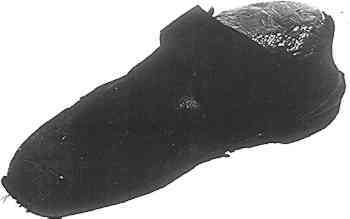 WHEN STABILIZATION was complete, the shoe was reassembled (Fig. 3). Using the holes from the original stitches, each part was sewn with dark colored cotton thread which had been coated with a microcrystalline wax. When sewing was not possible because the stitch holes had been mutilated, parts were adhered using a process similar to the one described for supporting a disruption. LINEN, HEMP, AND SILK have been the fibre-contents of the textiles recovered from the site of the DEFENCE. The treatment presented below was used in the conservation of these textiles to impart flexibility and stability. PRIOR TO THE INVOLVEMENT of professional archaeologists and conservators, several artifacts were recovered from the wreck of the DEFENCE. One of these artifacts was a partial stand of grape shot (Fig. 4). It was intended to be fired from a cannon, with an action similar to that of a modernday shotgun pellet. Originally, this object would have been made from wood, metal, and fabric (in this case, the wooden spindle was not recovered). The canvas bag with iron and lead balls inside had been allowed to dry without attention. When the artifact was finally submitted to the conservation laboratory some three years later, the metal balls were corroded and powdering; the textile was concreted in metallic salts. On mechanical removal of the surface concretions, the fabric remained stiff and brittle from the metallic salts still adhering to the fibres. Fig. 4. 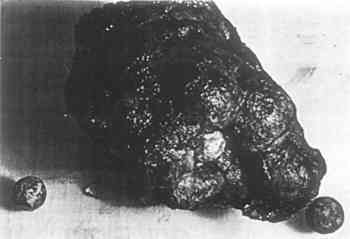 Stand of shot before treatment. The textile was woven in a tabby weave from rough spun yarns determined to be linen by microscopic examination. The count was 32 × 26 per inch. INVESTIGATIONS WERE INITIATED on samples of textiles similar in fibre content and structure to the artifact. After testing was completed, the following steps were instituted: removal of metal salts, immersion, and drying. Removal of metal salts: The removal of metal salts has been previously discussed (see removal of metal salts in the Leather Section of this paper). It was found that by using a 5% (w/v) aqueous solution of oxalic acid metallic encrustations could be significantly reduced in most textiles over a short time period (e.g. 1–2 days). The shot bag required a longer time, 15 days. Following this salt removal, the fabric was thoroughly washed with tap water for a week. Several years ago, a new preservative compound (Modocol) was introduced for archaeological materials.14 Its purpose was to provide support and flexibility for an archaeological textile. More recently, a similar mixture of Ethulose, PEG 400, and a fungicide has been employed for the stabilization of other archaeological materials.15 The use of these two methods of stabilization on DEFENCE textile samples caused them to become unacceptably brittle. Immersion and drying: To overcome the rigidity, tests were once again initiated. It was found that as a precursor to freeze drying, immersion in an aqueous solution of 1% (w/v) Ethulose and 5% PEG 400 would leave the fabric flexible. At the same time, it was consolidated. To prevent gross fibre collapse, the textiles were frozen (−18°C) and then freeze-dried following the same procedure as for leather (Fig. 5). Fig. 5. 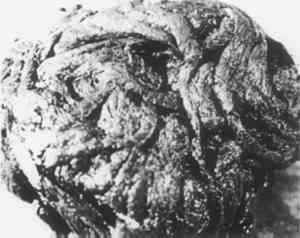 Shot bag after treatment. Ropes and wadding were found to need an additional treatment step. The freezing of the artifacts was interrupted at the point of “jelling.” This term refers to the state when the cords or lines and their fibres are still manipulatable in the highly viscous impregnating medium. 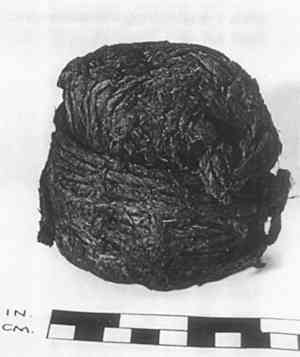 These artifacts were removed from the net casings and while held in place by the jelled solution, the individual cords of the rope or wadding were separated to reduce the matted effect of loose fibres (see Figs. 6 and 7). Fig. 6. Matted ball of wadding. Fig. 7. Specially treated wadding (jelling) and arranging of fibres. Fig. 8. 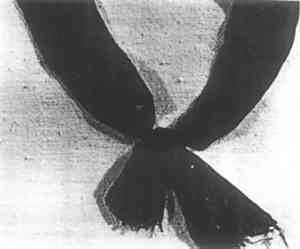 Ribbon on muslin. THESE CASE STUDIES and accompanying data represent the results of testing and successful treatments for leather and textile artifacts from the DEFENCE. The use of modified immersion solutions, oxalic acid to reduce metallic encrustations and freeze-drying for textiles are not necessarily solutions for the problems of other underwater sites, as each site varies due to biological and other environmental conditions. Other treatments and procedures related to leather and textiles are still under investigation. THE AUTHORS would like to thank Mr. Stephen W. Brooke for his assistance in these projects. In addition, the authors gratefully acknowledge major financial support provided by the National Endowment for the Arts and the Maine State Historic Preservation Commission. Switzer, David, “Excavating the DEFENCE,” A.I.N.A. Newsletter, Vol. II, No. 2, 1975. Ambrose, W. R., “Stabilizing degraded swamp wood by freeze drying,” Proceedings of the 4th Triennial Meeting of the ICOM Committee for Conservation, Venice, 1975. Rosenquist, Anna, “Konservierug von Nassleder durch Gefriertrachnung,” Arbeitsblatter fur Restauratoren6 (2: Group 9) 13–14, 1973. Rosenquist, Anna, “Experimentation on the conservation of waterlogged wood and leather by freeze drying,” Problems in the Conservation of Waterlogged Wood, W. A.Oddy. Maritime Monographs and Reports, No. 16, 1975, Greenwich, London SE10. Geijer, Agnes, Bostrom, H. and Axelson, H., “Modocoll som preparing onedel for textilier,” (Modocol as a preservative for textiles) Svenska Museer1 (1961). Lawson, Eric, Personal Communication, May 1977. 25 Cardena Road, Snugcove, Bowen Island, Von 1G0 B.C., Canada. Tilbrooke, D. R. and Pearson, C., “The Conservation of Canvas and Rope Recovered from the Sea,” Pacific Northwest Wet Site Wood Conservation Conference, September 19–22, 1976, Neah Bay, Washington, Vol. 1, p. 61–66. Rosenquist, A., ed.W. A.Oddy, 1975. Brooke, Stephen and Morris, Kenneth, “Conservation of Underwater Archaeological Artifacts from the DEFENCE: A Regional Conservation Center Approach.” Beneath the Waters of Time: Proceedings of the Ninth Conference of Underwater Archaeology, Texas Antiquities Committee, Publication No. 6, c. 1978, p. 93–97. Werner, A. E. A., As abstracted by Muhlethaler, B., in The Conservation of Waterlogged Wood and Wet Leather, ICOM, Edition Eyrolles, Paris, 1973. Smith, PaulI., Principles and Processes of Light Leather Manufacture, Brooklyn, NY, Chemical Publishing Co., 1942, p. 2–3. Sharphouse, J. H., Leather Technicians Handbook. Leather Producer's Association, 9 St. Thomas St., London, SE1, c. 1971. Waterer, John W., Guide to the Conservation and Restoration of Objects Made Wholly or in Part of Leather. G. Bell & Sons, Ltd., York House, 6 Portugal St., London WCZA 2H6. Geijer, A., et al, Svenska Musser, 1961. Brown, Margaret, “A preservative compound for archaeological materials,” American Antiquity, Journal of the Society for American Archaeology, Vol. 39, No. 3, July 1974, p. 469–473. Vierra, Sandra Greenwald, “Conservation of a Fan”, Journal of the American Institute for Conservation, Vol. 16, No. 2, February 1977, p. 3–11. Reeves, Pat, “Conservation of a Peruvian Paracas Necropolis Mantle,” Conservation in Archaeology and the Applied Arts, Stockholm Congress of the I. I. C., 1975, p. 21–26. AIN Plastics, Inc., 65 Fourth Ave., New York, NY 10001. Spunbonded olefin style 1079D, E. I. Dupont de Nemours & Company, Inc., Wilmington, DE 19898. Bridal Illusion 100% nylon net, “British Maid,” A & N Fabrics, 268 W. 39th St., New York, NY. (Average molecular weight 380–420), J. T. Baker Chemical Company, Phillipsburg, NJ 08865. (Chemical #B-381), Fisher Scientific Company, Pittsburg, PA 15219. “Skintex,” Technical Paper, 29 Franklin St., Needham Heights, MA. Talas, Jade No. 403, PVA, Technical Library Service 104 Fifth Ave., New York, NY 10011. Signo Trading International Ltd., 208 S. 14th Ave., Mt. Vernon, NY 10550.